Panathinaikos Athens opened the Top 16 with a hard-fought 67-66 victory over Zalgiris Kaunas at OAKA in the Greek capital. The Greens led for much of the contest, but Ksistof Lavrinovic led Zalgiris back in the fourth quarter. After a brilliant defensive play by Ibby Jaaber, Darjus Lavrinovic had an open jumper to win it, but missed and Panathinaikos celebrated the win. 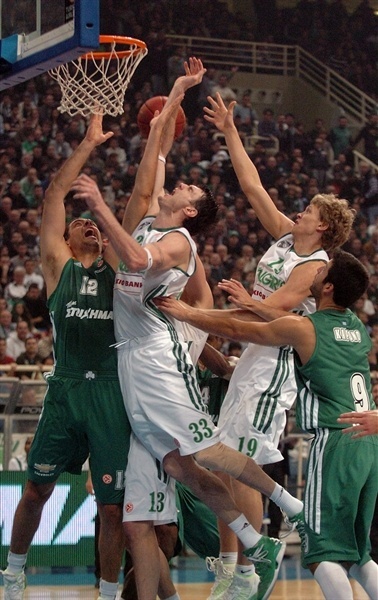 Jason Kapono scored 16 points on 4-of-6 three-point shooting in 17 minutes in his Euroleague debut for Panathinaikos, which played much of the game without star guard Dimitris Diamantidis, who left in the first quarter due to injury. Michael Bramos added 15 – all on three-pointers – and Stephane Lasme netted 14, including the go-ahead free throw with 51.8 seconds to go. Roko Ukic dished 8 assists for the winners. 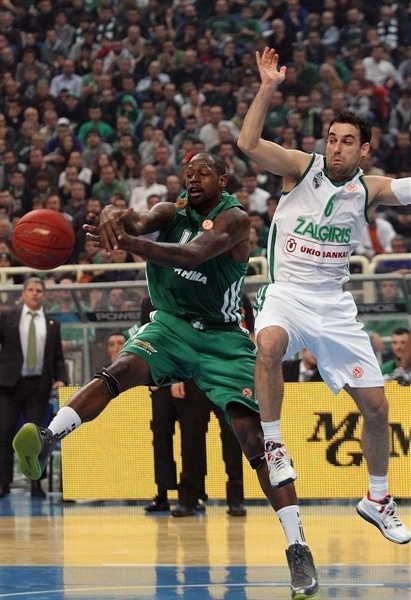 Ksistof Lavrinovic led Zalgiris with 13 points and Tremmell Darden scored 12 in defeat. It took Marko Popovic just 20 seconds to get things going with a three-pointer. He then assisted on Zalgiris’s next basket by Darjus Lavrinovic inside. 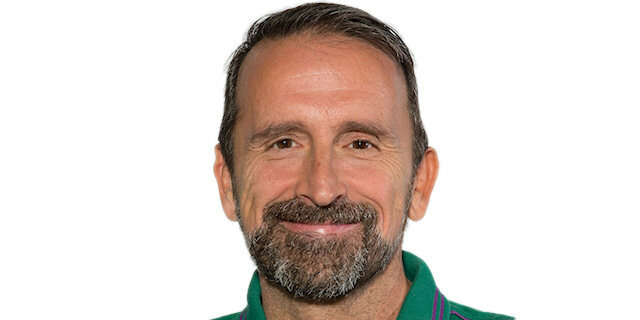 Jonas Maciulis opened Panathinaikos’s account with a three-pointer and Diamantidis also connected from downtown to make it 6-7. Bramos came off the bench and nailed a triple to put the hosts on top for the first time, midway through the first quarter. Lasme’s hustle on the offensive glass resulted in 2 more points before Marcus Banks completed a 10-0 run with a layup in transition. Darden ended a nearly four-minute Zalgiris drought, but Maciulis responded with free throws as the Greens started to cruise, 15-9. Rimantas Kaukenas set up Paulius Jankunas to narrow the gap, but James Gist came in and made an impact on defense, while Banks and Lasme scored easy baskets for the hosts. Mindaugas Kuzminskas scored for the visitors, but a second three from Bramos made it 22-13 after 10 minutes. Oliver Lafayette stripped Banks and scored an uncontested layup on the first play of the second quarter. A minute later, Lafayette’s layup in transition brought his team within 5. Kapono connected from behind the arc for his first Euroleague points, but the red-hot Lafayette matched him. Kuzminskas cut the difference with 25-23 with a triple. Kapono got the OAKA crowd singing with a three more three-pointers in a span of two minutes as Panathinaikos grabbed its first double-digit lead. After a timeout, Kapono continued his display with a turnaround baseline jumper before Maciulis added a jumper to cap a 13-0 blitz. Darden again ended an extended Zalgirs drought before Ibby Jaaber added a free throw. Darden nailed a three to close the gap to 38-29. Bramos and Ksistof Lavrinovic traded threes before Jaaber made it 43-33 at the break. Darden nailed a three on the first possession of the second half. Before lone, another Darden basket and a pair of Jaaber free throws closed the gap to 45-40. Jankunas struck from downtown as the Lithuanian champs closed to within one basket. 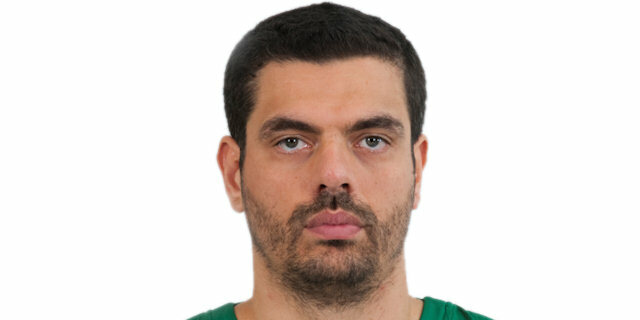 Bramos hit from deep to keep Panathinaikos ahead. Jankunas, on the offensive glass, made it 48-45. Bramos’s fifth three of the game extended the hosts’ advantage to 6. Jankunas free throws with 27 seconds left in the quarter left the score at 54-49 with 10 minutes remaining. 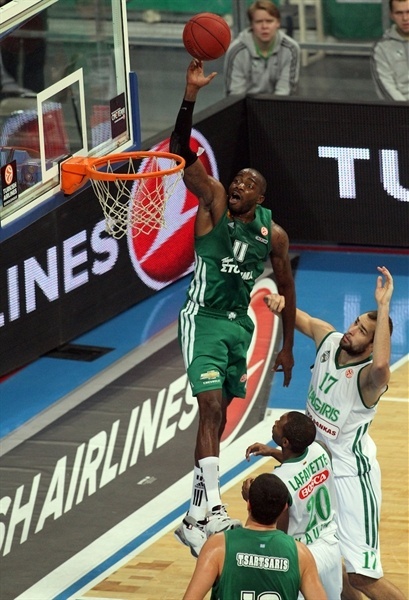 Gist took a pass from Banks for a baseline layup – his first Panathinaikos points. Ksistof Lavrinovic connected from behind the arc and then went inside for a basket to bring Zalgiris within 56-54. 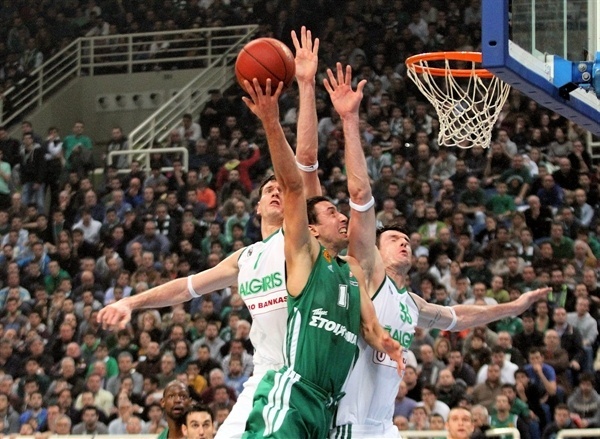 Kostas Tsartsaris fouled Kuzminskas at the rim and the forward knotted the game with the resulting free throws. Zalgiris’s defense denied Panathinaikos for several possessions before Ksistof Lavrinovic bounced in a triple to make it 56-59 with less than five minutes to play. 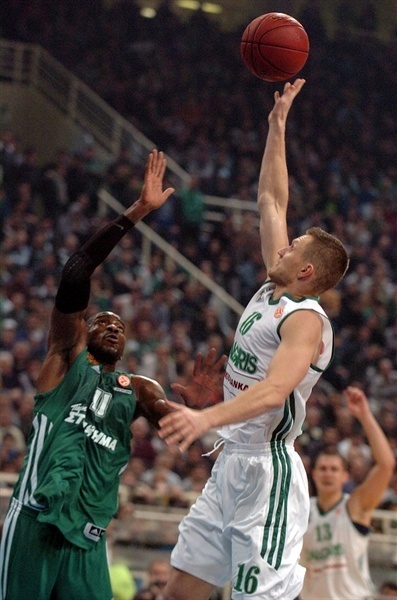 Lasme ended a five-minute Panathinaikos drought, but Popovic nailed a quick triple to silence the OAKA crowd. Kapono drew the hosts closer from the line only to see Ksistof Lavrinovic take a pass from Jaaber for another basket. Banks ignited the crowd with a triple to make it 63-64, but Jaaber pulled up for a jumper. Banks, with 69 seconds to play, split free throws to knot the game at 66-66. Darden was called for a foul when blocking Lasme at the rim and the big man put the hosts ahead by 1 with 52 seconds left. 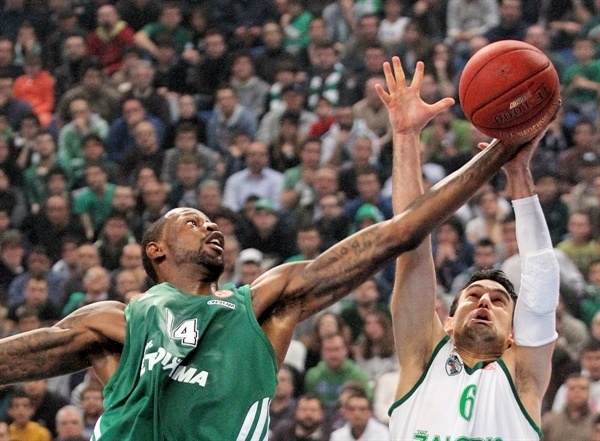 Ksistof Lavrinovic missed down low and Zalgiris was unable to secure the offensive rebound. However Jaaber placed himself perfectly to draw an offensive foul from Banks and get the ball back with 6.7 seconds to go. Zalgiris got the ball to Darjus Lavrinovic for a wide-open game-winning jumper, but it was short and the hosts raced away with the win. “Under these circumstances, it is a very appreciated win. We missed our creative players and this was a big problem, because we were forced to play with only one point guard and didn't move the ball well. Zalgiris was able to read the situation and took advantage of it. I think that our players are overachievers. Some of them led the others, because they realized that the situation was too dangerous. Kapono scored but also helped us to create plays on offense and brought some calmness and security to the team. 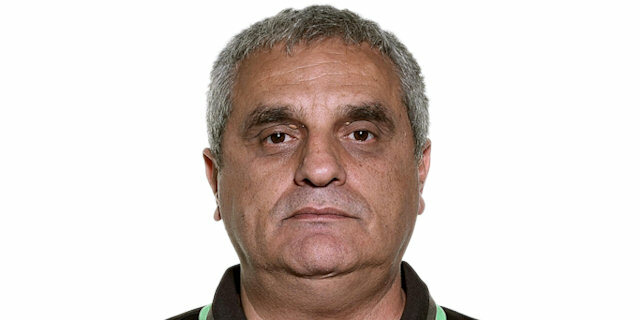 When things get tough, Panathinaikos and the whole Greek basketball have the know-how to fight and to survive. This is something that makes us proud." "I am proud of our capacity to recover during the game. It is true that if we want to compete against these teams, we cannot allow them to make so many consecutive three-point shots like they did in the first half. We didn't box out well to get rebounds. We woke up on time and worked better on defense, having two shots to win the game. We would have signed that before the game - to get this chance to win - but were not lucky enough. Sometimes winning or losing by one point is like flipping a coin. We have to learn about this, play well during 40 minutes, not just 20. We had a difficult regular season group with teams like Olympiacos, Efes, Armani and Caja Laboral. We know we need to rebound better if we want to win at this level. We competed until the end and I am happy for that reason." "After all, the victory is what it counts in sports. After the great performance in the first half, we had a lot of difficulties both in defense and offense, but we managed to beat a great opponent. 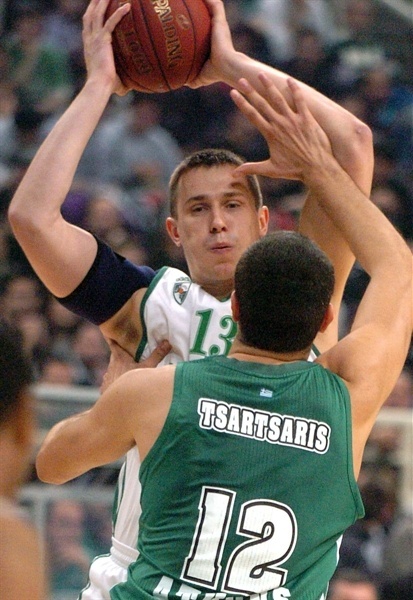 It’s not an excuse, but I have to mention that it is very hard to play without Diamantidis, who remained on the court only for four minutes and Schortsanitis." "It was a great game in front of a very enthusiastic crowd, which was cheering and pushed us to get the victory. I never had such an experience in the past and I am very happy for what we did. I tried to give my best, but my threes are coming from the whole team’s effort, it is not a personal success. We played very good in the first half, but then we missed the energy and played slow. Zalgiris took advantage of the offensive boards and the transition game and the game became a thriller. I like the situation here and I am looking forward to having more victories and great moments. "